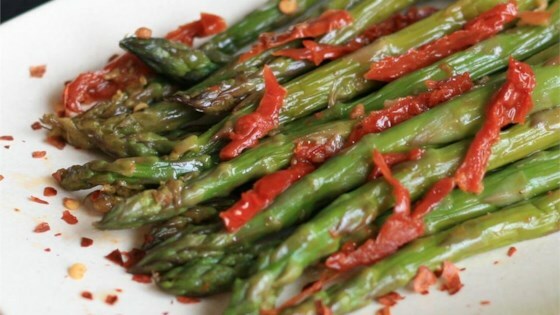 "Quick and tasty asparagus. Great with steak! Beef broth can be replaced with water or any other broth." Heat the olive oil in a skillet over medium heat; cook and stir the garlic and tomatoes in the hot oil until fragrant, 2 to 3 minutes. Add the asparagus to the skillet and toss until coated with the oil mixture. Season with salt and pepper. Pour the beef broth over the asparagus mixture. Cover the skillet and cook until the asparagus is bright in color and slightly crunchy, 7 to 10 minutes. Salmon combines with fresh asparagus and cherry tomatoes in this simple pasta. I would cook the garlic in low heat because it burns quickly. the asparagus where tender within 7 minutes. good side dish. Easy and yummy side dish! Works great with lamb too.